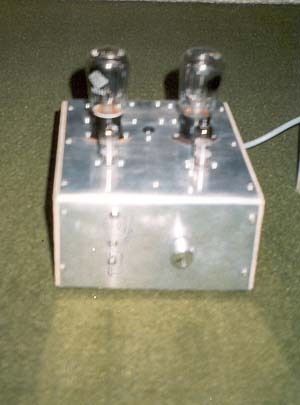 One of the early products of my tube amp experiments. Today I really wound not recommend using a pair of almost new RE134's for such a project. 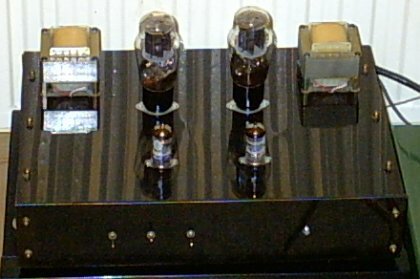 But the amp worked and sounded really fine but was dismanted after one year of service after one tube broke. One of these is standing on my desk and is waiting for service in an upcoming audion receiver. 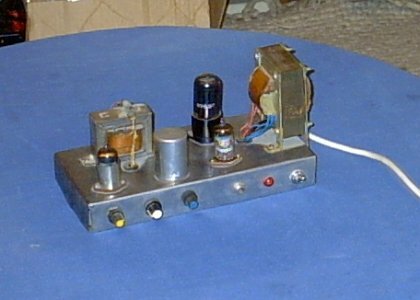 This was ( maybe still is ) a EL84 push-pull guitar amp that was made from parts from an old Tesla tape recorder and from an Telefunken radiogram. Only some resistors and caps were bought. I used this amp occasionally and carried it through half Germany during a school trip. During this trip the amp was bounced around all the time and water ran over the chassis when our radiator broke during one night. Some month later I sold it to someone and tried to send it via German parcel service. When the amp arrived, the chassis had left its place and literally trashed everything into pieces including the output transformer HV-winding. I traveled to the amp during one holiday and rebuild it with only the parts that had survived and it worked again. 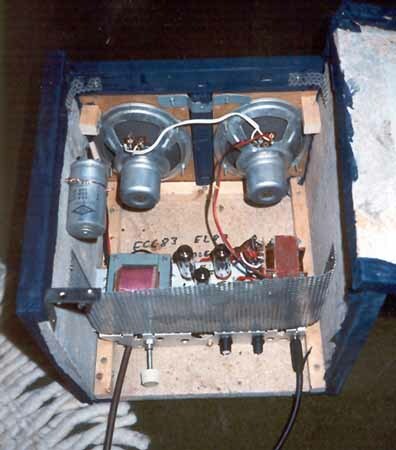 Here you can see a 845 power triode amp I started in 1994. At this time I was still visiting school and was like most people of that age regulary out of money. So this project developed in very small steps over the years. 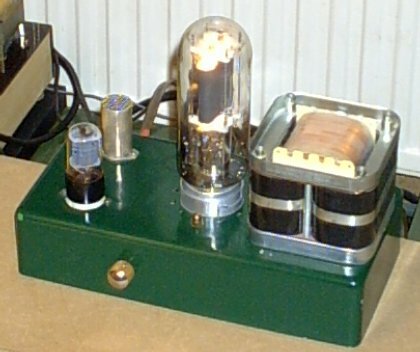 The picture shows the amp 2 years ago with a EL32 compatible tube in the driver stage. In the now almost finished version there is a 6SN7GTB in the driver stage. The amp has 2 ( stereo ) inputs and internally mixes the two channels. It is designed to be used with a subwoofer to support my 2A3 stereo amp. 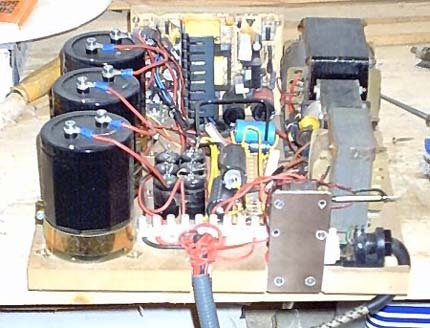 This picture shows the internal wiring of the 845 triode amp during development. Some parts have moved since then but the basic layout is the same. The power supply for the 845 employs 3 transformers for 4 different voltages and 1 switching power supply. Output is 1000V=( anode HT for the 845 ), 310V=( U+ for the preamp and driver stages ), 145V= ( bias for 845 ), 6V AC ( preamp and driver filament ) and the 10V DC for the direct filament of the 845. The case of the whole power supply has only venting holes, no external switches or indicator lamps. 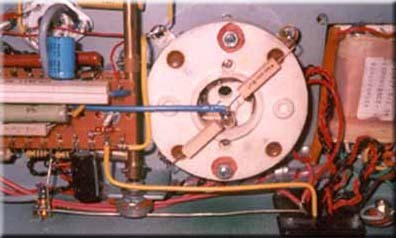 The supply is activated by means of a reed-switch and a magnet that can be seen in front of the first transformer. I recently picked the the finally running amp from the shelf again and gave it a try. This is a somewhat illfated project as the amp is only mono as I intended to use it on an additional subwoofer, which did not work out too well because of the low grade of damping triode amps show to external loads. To use it as a normal amp I would need to build a second one which is currently not in sight. However, this picture at least shows it working, the glow of the 845 is realy far beyond anything you see from tubes like an EL34. 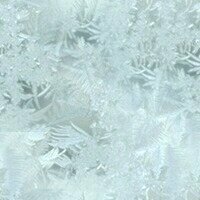 Amlmost brighter than desired. I would not say it sounds spectacular, I like the 2A3 much better. This is my everyday amp. 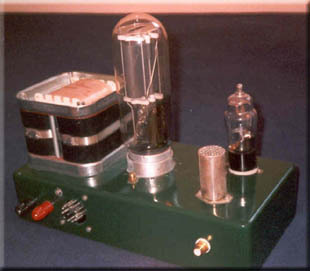 It's a 2A3 triode with ECC83 tubes in the driver stage. I built this amp almost 12 years ago, and aside from one cap failure which was very spectacular I never had any serious problems. While taking some pics this little 6V6GT amp came into my mind. While this is not the very first amp I ever built, it is the first one which included such a usefull feature as a casing, the one or two projects before were simply thrown together on my workbench. The amp was intended to be a guitar amp as I was starting to play electric guitar at tat time. To be honest, this amp sounds like crap, don't ask me why, but playing guitar on your PC-speakers would probably sound better. Maybe its the output transformer which originaly came from a radio which is most probaly not designed for the great overdrive experience... at least not willingly. The good thing is the integrated tremolo using an ECC85, at least a good use for this otherwise worthless tube.